The total market for coffee in America is worth about eighteen billion dollars. That’s $18,000,000,000 if you like to see zeroes. If you’re opening up a coffee shop in SOMA, is this figure relevant to you? Of course not. Because while all coffee sold in any form to anyone in America is indeed an eighteen billion dollar market, that’s not the market you’re entering. Your concern is your total addressable market. To put it simply, if you converted every single customer within your reach, how much would you make? This is a much trickier question to answer, but it’s the only one that matters. What customers are within your reach? Misunderstanding what your actual market is causes what is known as the Chinese Glove Problem. When you tell someone you’re going to go after the Chinese market, you can back it up by saying that even if you only get 0.1% of the market you’ll still be rich. Percentages don’t pay money. People do. A projection such as 0.1% of “China” sounds deceptively easy when compared to it’s identical number (1.4 million customers). It’s important to understand which market matters to you. At the top is the total theoretical demand for the product. 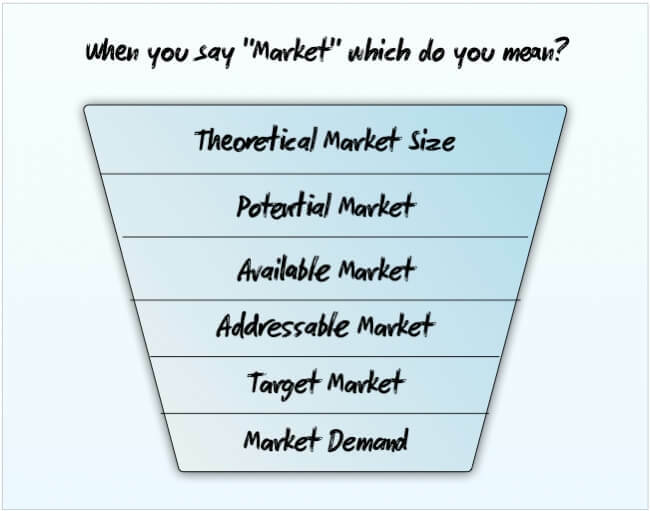 The potential market is the most popular understanding of a market. It means the sum total of all professed demand. The available market represents who is there for the taking. This means they have sufficient income to act and purchase. The addressable market represents those who are within your reach, after barriers like location, language, culture, etc. have been factored in. The target market is who you decide to go for. For a cafe this is closely related to where you place your cafe. The market demand is the demand by your target market in a particular period. So you can quickly see why we drop many zeroes and arrive at a $1M market. In short, the demand for a cafe is best defined by where it is, who else is nearby, and how it is positioned within the local market (e.g. young and trendy vs. family oriented, high end vs. low end, etc.). We’ve all seen a variation of the above arithmetic. 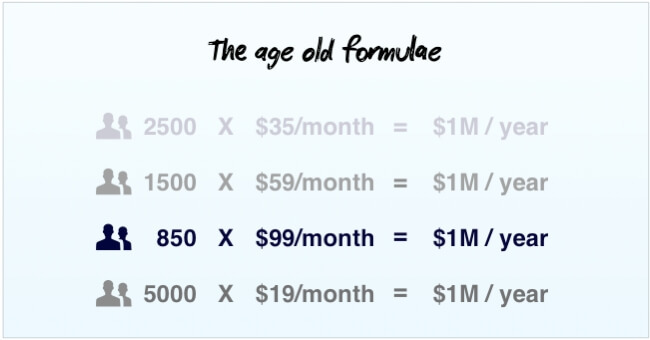 Some people prefer a small users base and high price per month instead. You can play with the numbers but the math doesn’t change. There are billions of people online, so one could argue that two thousand users is a tiny fraction that is easily within your grasp. 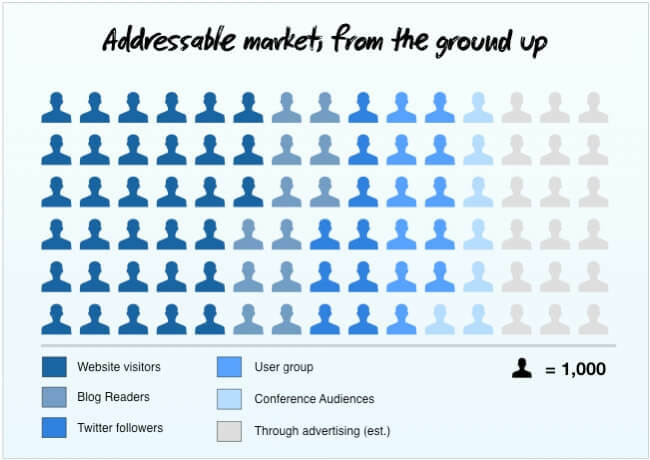 Once again we’re confusing potential market with addressable market. It’s easy to see how a cafe in San Francisco will never make money off coffee afficionados in Huntington, Indiana. Heck, even getting customers from more than three blocks away is an achievement. Online there are no geographical boundaries, so suddenly everyone is in your addressable market, right? Customers don’t have to travel to use your product but every other barrier still exists. This means you still need to see your market as those you can reach through your marketing, advertising, blogging, tweeting, affiliate links and any other activities you use. Cafes have a small captive market of people looking to a grab a coffee somewhere near their office. Online your potential customers are trickier to pin down. They don’t all live or work in a three blocks square neighbourhood and you’re usually not the only one chasing them. The addressable market for start-ups is best defined by the mindshare you can reach. If you think of the web as a massive collection of small- to medium-sized communities (or markets), you see that you need to gain mindshare in each of them. You can reach some developers through Stack Overflow, open source contributions, or popular development blogs. You can reach start-up communities through Hacker News. You can reach designers through Dribbble. Looking at any community, you’ll quickly realize that you’re never the only show in town. If you’re selling invoicing apps to Hacker News readers, you’re not the only one. If you’re answering questions on Quora to gain credibility about analytics, you’re not the only one. If you’re waiting for Daring Fireball to link up your new iOS app, guess what? So’s everyone else. Acquiring customers through Google ads and Searches is a different strategy. You’re not looking for word-of-mouth here, you’re pitching to transient strangers who happen to be walking by. Targeting the front page of Google is equivalent of open a shop on main st, or in the tourist trap area of a town. You’re guaranteed lots of footfall, but rent is expensive and the visitors aren’t likely to stick around. 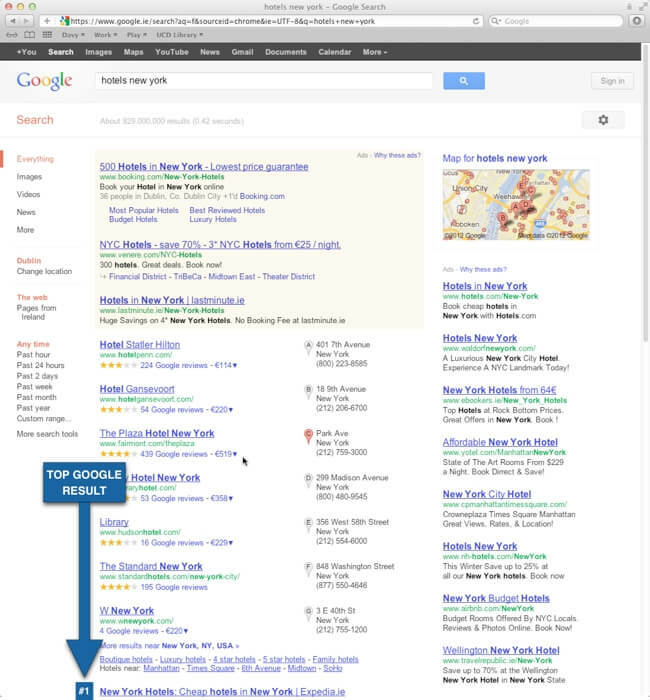 Besides, as the above image shows, your number one competitor on Google is, well, Google. This can send you lots of business, but it depends on what you’re selling. As I’ve said before, the path to product for start-ups is rarely “Hmm, I’d love to try an online project management tool, I must go to Google and see if such a thing exists“. 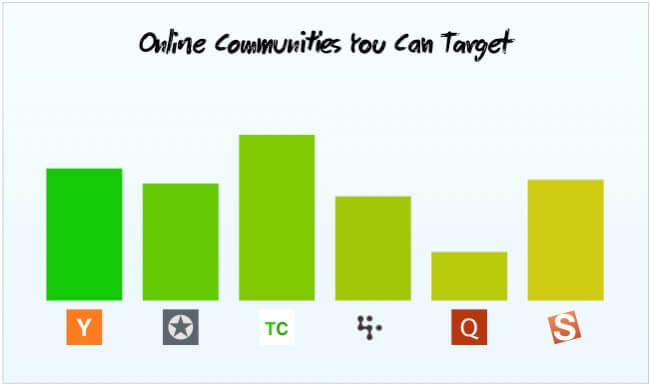 Rather than starting with sum total of all online users, try starting with your current audience. That is, the sum total of all the subscribers, website visitors, friends, associates, readers, followers, and contacts of you and everyone within your team. These are all people immediately within your reach. This is the minimum size of your addressable market, and I’m guessing it’s some way short of two billion people. This is your equivalent of the three block by three block square that you’d open up a coffee shop on. Another way to view your challenge is finding something you can sell to 500 of these guys. This is why I believe that customer support is the defining characteristic of early stage start-ups. Your first couple of hundred customers are what makes or breaks you. Delighting your early customers by showing them how much you care is vital in the early days. They will tweet, blog, refer, boast, post screenshots, and more, all spreading the word for you. Crucially, this expands your addressable market. Happy customers beat the crap out of any marketing team you could hire, and they’ll pay for your app while doing so. People response to this with the usual “How does this scale?” As many have noted, spending too much time stressing about what you’ll do when your customer base is huge is a good way to make sure you never have that problem. The simplest way to scale is to grow a team dedicated to giving customers a remarkably good experience. How and when you should grow varies depending on the price point, type of customer, and importance of service. Growth doesn’t suit everyone, folks who don’t like it might have to be content with just one million dollars per year. As I’ve written elsewhere, amazing customer experience is the next must-have attribute for online businesses. It’s not a case of when you should start focusing on it, the ship has already sailed. The only question is: when do you want to start chasing it?